A collaboration with a sustainable brand Marina Vaptzarova during early November. 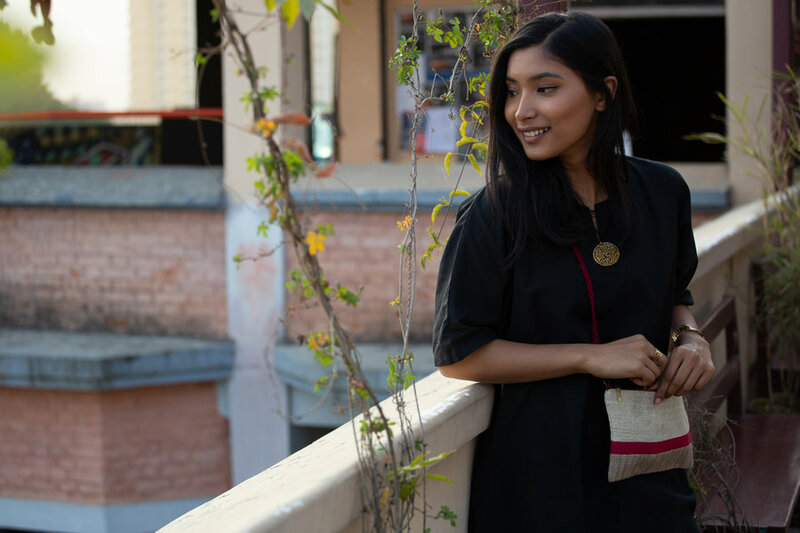 In this post I am featuring accessories and jewelleries from the brand itself and clothes from Drichu to complement the natural textures. In a time of living up to fast-paced lifestyles and busy schedules, it is important to take time to slow down. This applies to our daily lifestyle habits and objects that surround us. 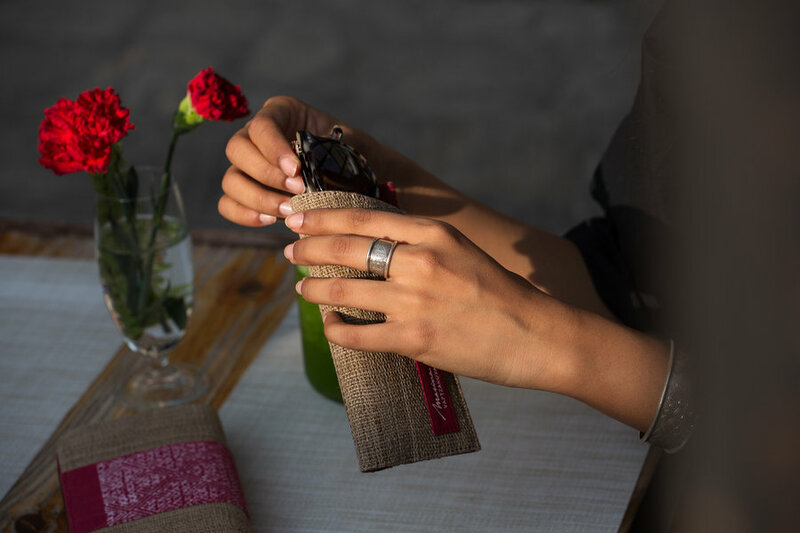 I have experienced the positive energy when surrounding oneself with objects and accessories that are slowly made. While giving careful attention to details. YAK WOOL scarf, handwoven in Nepal. The immensely soft hairs are gently brushed, just before they shed naturally, from the belly of the Himalayan Yak found in the high plateaus between Nepal and Tibet. 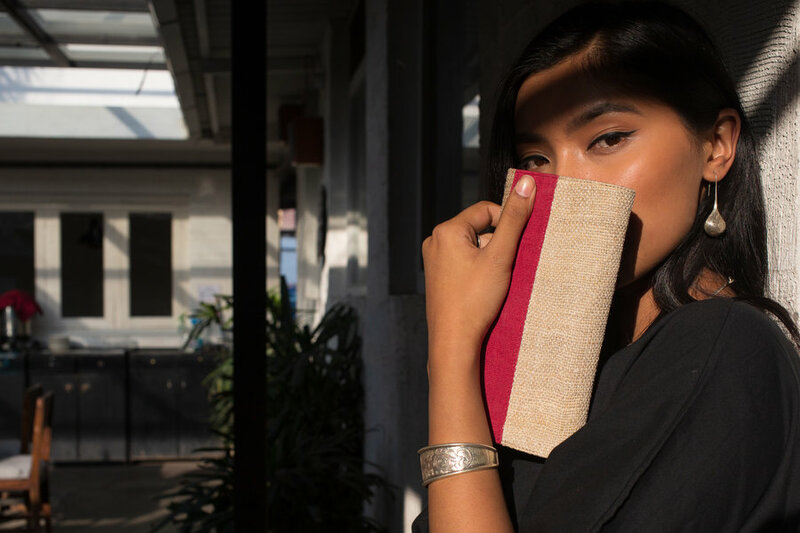 The handwoven yak wool also covers the NUMA-LA journal, creating a cosy and elegant aesthetic that sits beside Marina's innovative vegetable leather - made from plant fibers also found in Nepal. 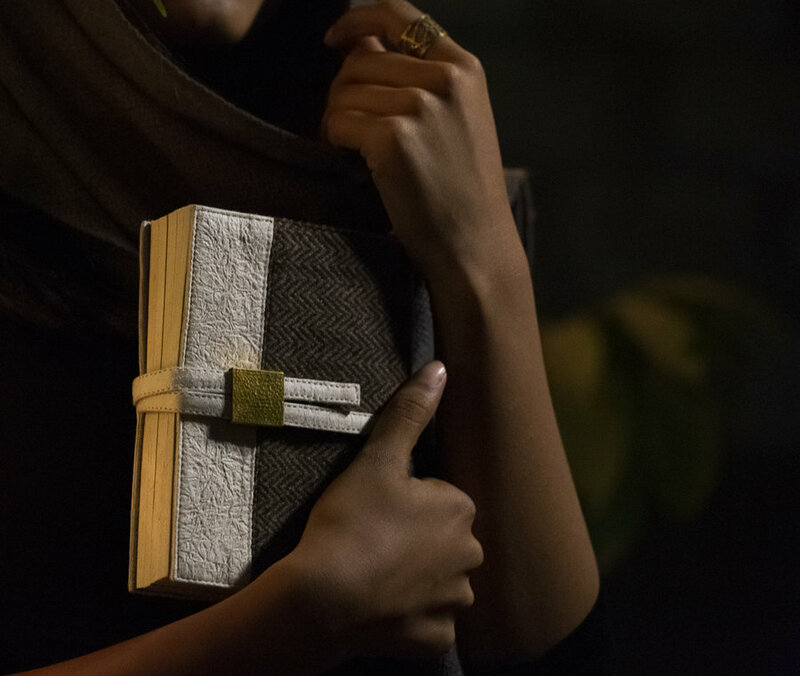 The journal is adorned with a gold plated clasp, handcrafted in Kathmandu by renowned goldsmiths, preserving traditions from weaving, paper making, and metalwork. All assembled by craftsmen in Nepal. 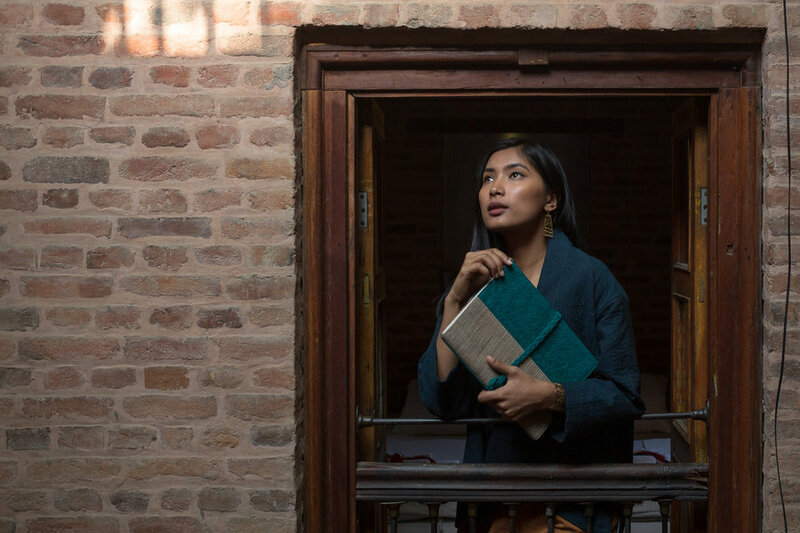 THE TSATSALUNG ARTISTS sketch book is designed to inspire what will be created in it's inner pages. Wrapped in a hand-spun cotton plaited cord to hold these creations safe. 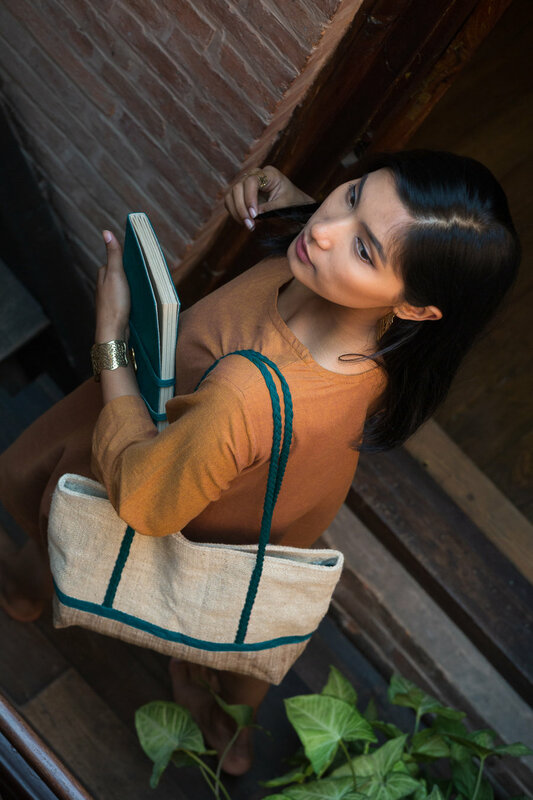 Teal and natural SAMLING bag produced with the most sustainable textiles: ALLO (Himalayan nettle) and hemp waste. The purse I am holding borrows a pattern from the Hmong, a tribe living in the Golden Triangle. This pattern is inspired by the HMONG BATIK, silkscreen printed on linen that wraps around the nettle weave base of the purse. 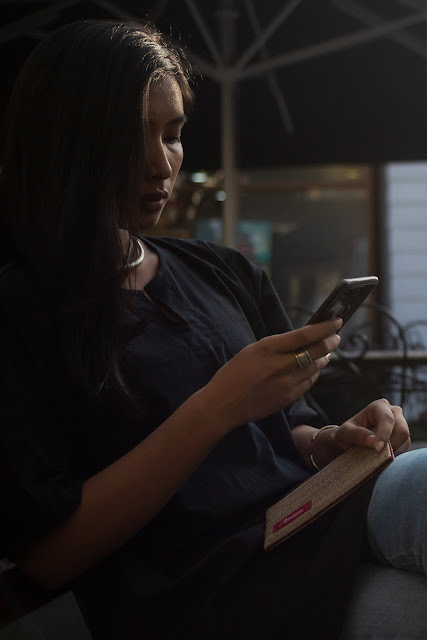 And throughout this connection and inspiration from different parts of the world, the Hmong tribe meets a Himalayan tribe to create a finished product by Kathmandu's craftsmanship. SAMLING bag made out of Nepal's most sustainable weaves Himalayan nettle and Hemp which is strong and durable. The bold red collection is my favorite. Each Marina Vaptzarova product is the expression of dedicated quality and exceptional craftsmanship. In the manner of Haute couture, Marina Vaptzarova designs are one-of-a-kind. Made by hand at every turn – every page and fabric, every cut, fold, stitch, dye and print are patiently carried out by hand. 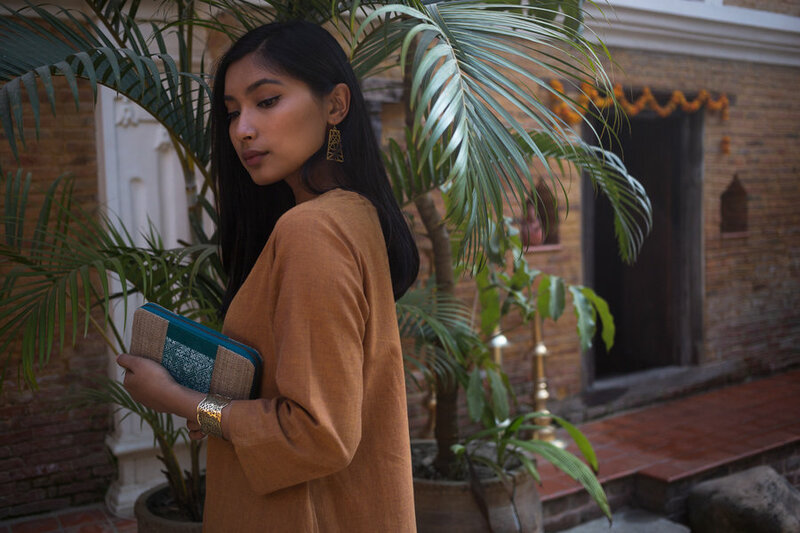 Marina Vaptzarova is committed to donating 1% of sales to the Nepal Youth Foundation, who are dedicated to providing freedom, health, shelter and education to Nepal’s most impoverished children.